Despite popular belief, there is no clutter fairy that comes by and messes up you house, even though clutter seems to magically appear. Clutter is about lifestyle. There are many ways to go about clutter, but it really depends on your habits and your clutter style. Where does the clutter come from though? What you get in the mail is one of those forms of clutter that you have less control over. It comes whether you like it or not. There are ways to opt out of some mail, such as credit card offers. It usually states at the bottom of the letter something to the degree of “to stop receiving pre-screened offers of credit from this or other companies, call here.” By opting out you can greatly reduce the amount of incoming mail-clutter that you would normally have. For everything else, there is always the recycle bin or the shredder. To avoid mail buildup, you can always set up a system or set of habits to get rid of the clutter before it builds up. 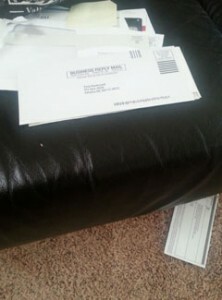 In this case, don’t even let the mail sit on the table, couch, or it’s usual spot it seems to build up on. Open it immediately and sort it accordingly. If you honestly have no time at that moment, assign a spot for temporary mail purgatory, a place where mail is neatly hidden away until the time in which it can be filed. 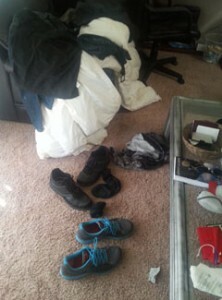 Clothing is one of the more preventable types of clutter. Sure, after a long hard day you may just want to strip out of your clothes and throw them down in the closest available space, but by creating this habit, you create much unneeded clutter that takes far more energy to clean up in the end than it would to put it where it belongs in the first place. If you commit to yourself that the dirty laundry goes into the laundry bin, laundry pile, or designated laundry spot, this stops the laundry clutter from forming in the first place. Is the laundry thrown down somewhere because it’s not fully dirty yet? Then designate an area for half-worn laundry to hang out. If it doesn’t smell at all, you could even make a special area in your closet designated for hanging up half worn clothing. That way it will stay nice for when it’s time to wear it again. Sometimes you suddenly stumble upon a conglomerate pile of, for lack of better word, junk. How I see this junk is really a visual to-do list. If you think about it, your pile of stuff represents things to-do that have yet to be done. Whether it’s some ripped pair of pants that need to be sewn soon, paperwork you need to read, garbage and recycling you need to take out, dishes you need to clean soon before mold spores form, or receipts that remind you that you need to work on your budgeting, each item represents some unwritten to-do list item for you. Perhaps you just haven’t made the time to get to those items? Maybe you’ve been putting them off? Finally you’ve reached this pile and it may seem insurmountable. No matter the size, it can be taken on, one step at a time. 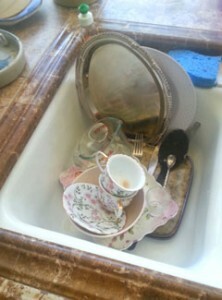 Do you set your dirty dishes down after using them without cleaning them or putting them away? The best way to counteract this habit is to clean as you go. Before running off to complete some other task, wash your dish, or put it in the dishwasher, then allow yourself to move onto the next task. Allow yourself that extra time to cleanup so it doesn’t build up. Large meals that have over 10 different dishes to wash are different because they require more time. My best advice is after you finish eating, actually designate the time in which you will commit to cleaning those dishes and schedule it into your day. It might be right after the meal that you decide to do them, or it might be the next day, but actually set a time that you plan to clean them so they don’t multiply into gremlins and take you off guard. First you must understand where the clutter comes from. Clutter is usually self caused, unless you live with messy people who couldn’t care less about cleaning up after themselves. 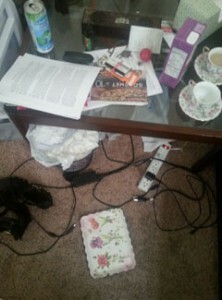 Self caused clutter is what I’m referring to. If you first understand how the clutter got there and what habits contributed to their collection, you will find out how to fix the situation. You can unlearn your current habits by first creating awareness of them. 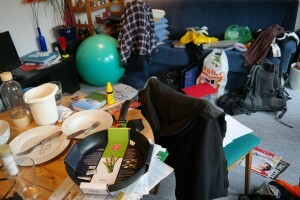 Then you can find a plan that works best for you in order to turn your cluttered space into a clean and organized one. 1. Where do I put my clothes when I am finished with them. Where should I put them? 2. What do I do with my dishes after i’m finished eating/drinking? Where should I put them? 3. Where do I put ___________ (replace blank with the clutter of your choosing). Where should I put them? This trick really works with anything. You know the best answers to what you should do, sometimes you just need some inspiration to think about those things and to think of ways to better your situation. You know better than anyone else about how much space you have, locations you have for storage and space, where your clutter hides, and the reasons your clutter forms. I challenge you to spend at least 10 minutes today thinking about your own clutter and the best ways for you to cut clutter. If you can’t take all your clutter on at once, spend at least 5-15 minutes each day working on it in blocks. Even literally setting a timer can help. You don’t have to take on the gremlins all at once. You can take them on even in 10 minute block intervals. As long as you’re working towards them faster than they multiply, you’re making progress. Clutter doesn’t stand a chance if you declutter faster than clutter can form.